The Distal Radius is the end of the radius, one of the two bones in the forearm. The Distal Radius is part of the wrist joint, where it moves with the small bones of the wrist. A Distal Radius Fracture involves breaking the end of the radius within a couple of inches of the wrist joint. There are many variation of a Distal Radius Fracture; the fracture may or may not extend into the wrist joint itself and the broken piece of bone may or may not move out of place. The force of the injury and the quality of the bone are big factors in how severe the fracture is. A Distal Radius Fracture is a very common injury, with over 600,000 cases reported in a recent year and there are signs of increasing frequency. Pain, swelling, and bruising are very common with a Distal Radius Fracture. If the broken bone has moved out of place there may be a noticeable deformity to the appearance of the wrist. Attempting to move the wrist will be difficult and painful. Moving the fingers will also be painful. A Distal Radius Fracture with a significant deformity can cause numbness and tingling in the fingers due to pressure on the median nerve in the carpal tunnel. Such a situation requires immediate attention to take pressure off the nerve. Falling onto an outstretched hand is generally the most common cause of a Distal Radius Fracture. Upon hitting the ground, almost all of the force is transmitted through the Distal Radius, causing it to break. Simply a fall while walking on the sidewalk may produce enough force to cause the Distal Radius Fracture. Higher energy falls, such as in skiing, snowboarding, cycling, football, basketball, skateboarding, and ATV, also commonly result in a Distal Radius Fracture. Speaking with you about how the injury occurred and examining your wrist are essential. An x-ray will confirm the diagnosis and provide information about how many broken pieces there are and whether the pieces have moved out of place. It is also important to examine the rest of the upper extremity to check for other injuries that may have occurred in addition to a Distal Radius Fracture. Sometimes a CT scan is helpful to evaluate complex multi-fragment fractures. 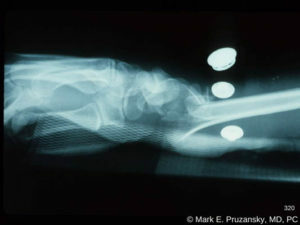 Simple fractures in which the broken piece hasn’t moved are well treated in a cast for 4-6 weeks. 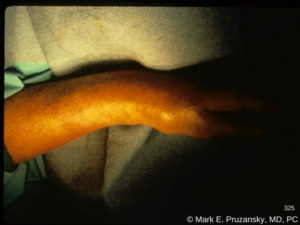 Fractures that have moved out of place may sometimes be pushed back to where they belong and held in place with a cast as well. Unstable fractures or cases involving joint disruption are good candidates for surgery to improve the anatomy and minimize the risk of pain and arthritis. Surgery generally involves examining the joint through an arthroscope (a small video camera) that allows direct visualization of the joint surface to assist with accurate reduction of the fracture. In addition, arthroscopy of the wrist joint permits evaluation of other important joint structures such as ligaments and the TFCC, which may be injured during a Distal Radius Fracture. Fixation of the Distal Radius Fracture most commonly involves a metal plate and screws placed through an incision on the front of the wrist. Additional pins and/or an external fixator are utilized for severe and highly unstable injuries. If the TFCC or other wrist ligaments are found to be torn, these are repaired at the same time as the Distal Radius Fracture. Distal Radius Fractures are common and the ability to return to a pain-free and functional wrist depends on early diagnosis and prompt treatment. Call Dr. Pruzansky at 212-249-8700 to schedule an appointment and begin to address your wrist injuries. Video description: The lunate is above and the stellate radius fracture below. The fracture fragments of the articular surface are shifting during my reduction using external pressure and distraction.